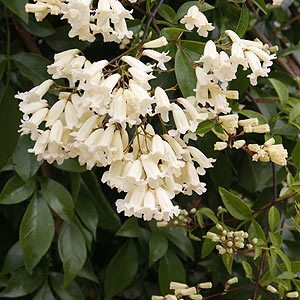 One of the outstanding flowering native climbing plants is Pandorea pandorana ‘Snowbells’. Masses of snowy white flowers from spring to summer with spot flowers through to early winter. The flowers are a pure ivory white with a slight fragrance. This is a vigorous evergreen climber that will quickly cover a trellis, pergola or fence. An excellent choice for growing up a column where the flowers can be shown of to their best. Best grown in full sun to part shade ‘Snowbells’ can be pruned back after flowering to help maintain size and shape. Heavy frosts can be a problem, however plants generally recover well. For great results plant Pandorea ‘Snowbell’ in a position where the root system in cool and shaded yet the plant grows into full sun. Although it is a plant that thrives in a humus rich well drained soil it also copes with dry summers. Fertilize with a specialist native plant fertilizer in spring. Fast growing climbing or scrambling plant. Best is a humus rich soil, however very adapatable. Can reach 8 – 10 m, howver usually less and can be tip pruned from an early age to maintain size. Available for sale from specialist native plant nurseries.